Coming from the Marvel Comics, here's an absolutely amazing tribute to the North American box art of Mega Man 2. Illustrated by the famed Toshiaki "Shinkiro" Mori, this piece complements Ron Lim's previous Marvel vs. Capcom Origins tribute art. Snazzy, no? 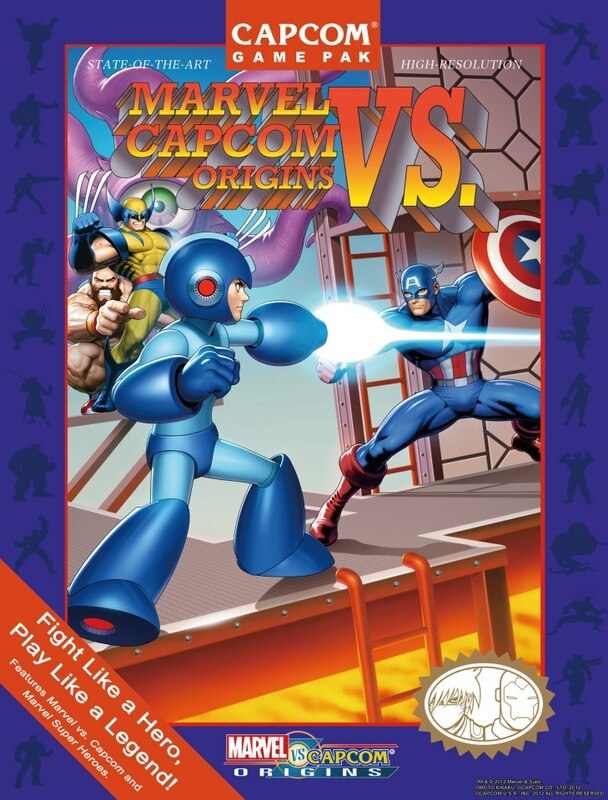 Due out next month, Marvel vs. Capcom Origins acts as a compilation of Marvel Super Heroes and the original Marvel vs. Capcom for Xbox Live and PlayStation Network. The game will feature graphical filters, GGPO net code online play, in-game achievements, 8-player lobbies, spectator mode, and replay saving. All this for $14.99 or 1200 Microsoft points. Anon3: I don't think so. He had to tone it down a bit to make it look more "authentically bad", I think. Yay more jokes about bad box art from decades ago. That and merchandise seems to be all Mega Man is any more. Woo. Just wish Shinkiro would of made Mega aaaaa little more like his traditional "anime" style like he did for Zero, Roll, & MegaMan Volnutt for TvC, but eh...this is still great! Too bad it stopped being funny after the 50th time. Would all you complainers rather MM be like a lot of other Capcom franchises: completely inactive? You know what us Viewtiful Joe fans have to look forward to? Absolutely nothing. Personally, I like the poster. I was planning on going to PAX since I've been almost every year (I live within driving distance and my parents are in the Seattle area,) but PA botched the badge sales and they were sold out before I could buy one. And I'm not just saying that because of sour grapes. They tweeted badges were on sale, the massive traffic crashed the server and it was down for a about a week. They started selling again on a weekday morning while most people were at work or school with absolutely no advance notice, and were sold out of 3 day and Saturday badges within hours. Of course, scalpers were selling them on ebay the same day. Lots of people were pissed, and they say they'll do it differently next year. Yes, by all means, make comics about a character that you've been excluding from the latest games in the series. It makes perfect sense, doesn't it? I'll be at PAX! This isn't the greatest poster Capcom's ever given away there, but I'm definitely still getting a few. why is capcom of america so obsessed with crappy american megaman nes boxart? I thought it looked bad during the 90s and I still think it looks bad. Lol, I gotta say. That's an amazing piece of art. Wow. It's such a fresh change, especially the way he and Roll were crammed into the lower right corner of the original MvC JP cover art. [[I am not talking about the straight-port to the VC. No official cancellation, unlike Legends3(Prototype), and I know there's a zero (0) percent chance that it's still coming out, given the current state of the franchise, video-game wise. Still, I find it odd that CAPCOM didn't choose to explicitly kill off the project.